The better to eat you! Falling into the category of content trumps quality. There’s been a large band of rain coming through our area, and I know when it rains at night it means foxes in the morning. Unable to hunt in the black of the night, Foxy Junior is known to trot through the manor’s garden around nine in the morning. Knowing that he was probably hungry from a wet night, I set out some chicken for him in a bowl. Sure enough, true as clockwork I saw him trotting around the front driveway, and heading to the back where the chicken was. Grabbing the camera, I had to shoot through the window. But he was quick! Trying to figure out his good fortune he sniffed around. I thought he’d take one piece at a time, then come back each time for the next. But not this time. 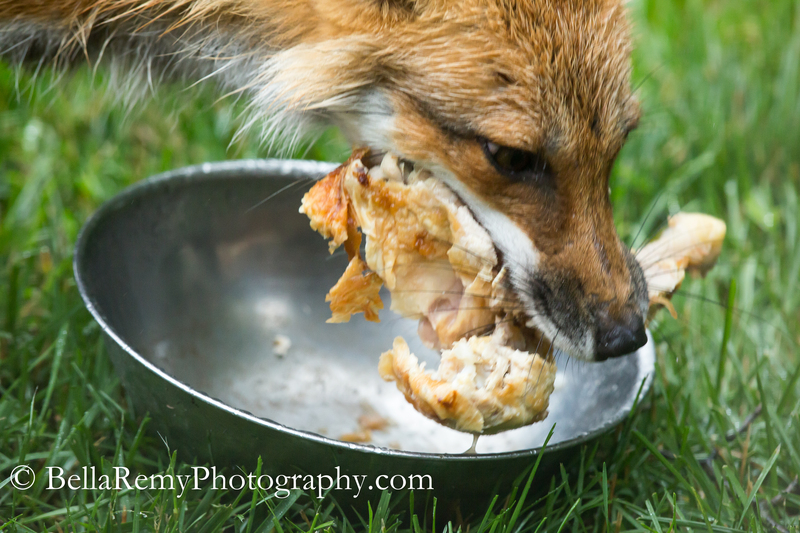 What a big mouth Foxy Junior has..he loaded up all four pieces and ran off in a flash. After a few weeks of feeding they’ll really look much better. Are you feeding them cooked or raw! Actually I haven’t put anything out in quite some time. There were some baby ducks that I noticed were fewer in the flock though. This is cooked chicken, although dog food would be preferred. 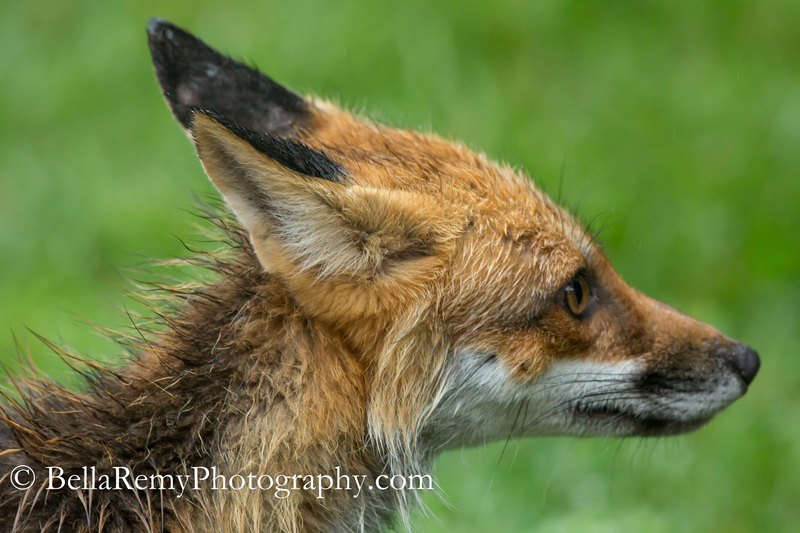 I know foxes are bad news for farmers, but I still think they are beautiful animals. They truly are. 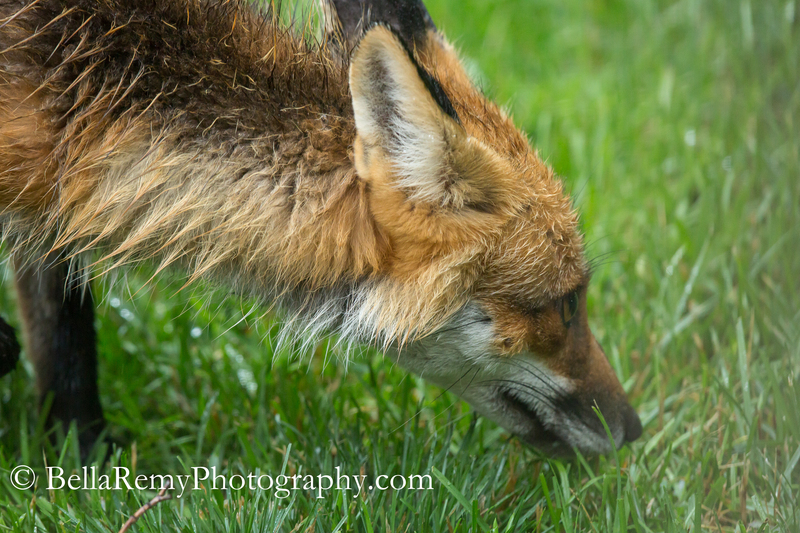 I have some friends that follow foxes in a natural wildlife refuge. They are truly amazing hunters. Oh! That nice lady put food out for me.. nom nom nom! You know he was grateful. He got goodies for two days, but now the rain has stopped so no more extras. Although he could use putting on some weight. Either that or he needs to start catching my big fat squirrels!! If I were you, I’d cook a turkey! More good news all round! LOL ! With all the night critters I’d need a COW !! Thanks Fatima. He is adorable. Thanks Stephanie. Oh I can’t tell you how excited I am about the foxes. I was in fox heaven all day seeing him.